Does Red Meat Cause Cancer, Heart Disease and Eternal Damnation in Hell? Earlier this week every major news organization published an article on a recent study that was published Monday in Archives of Internal Medicine. A research team led by Rashmi Sinha, Ph.D., from the National Cancer Institute looked at more than 500,000 people aged 50 to 71 and came to the conclusion that red meat causes cancer, heart disease and if we avoid it, we will live longer. Headlines read ‘Want to live longer? Cut back on red meat’ and ‘Premature death from red meat’ and other similar sensational titles. You want to know the real deal with red meat? The truth is this — If you want to avoid illness, disease and live a long robust life, you may not need to cut back on red meat. You may, however, need to cut back on TV and consider giving yourself a detox from mainstream news sources. You also need the ability to think for yourself and not believe everything you read. Seriously, you do need to understand some FACTS about red meat which were not covered in ANY of the articles I saw. You also need to understand a few simple TRUTHS that were completely ignored by this massive study that created more mass confusion than anything else. The red meat in the study included all types of beef and pork (I thought pork was ‘the other white meat’? ), bacon, cold cuts, ham, sausage, hamburgers, hot dogs, steak, as well as meat in pizza, chili, lasagna and stew. So I’m going to drop some serious nutritional knowledge bombs on this report and give you solutions so you can eat what we are designed to eat, support your local economy, promote a healthy planet and avoid disease. The first thing I noticed in almost every news report was that they ignored the fact that processed meats are made with chemicals, including sodium nitrate or nitrite, a preservative, flavor and color enhancer that’s also used in fertilizer. Nitrates, along with excess table salt and smoking, extend the shelf-life of these crap products so they last longer in 7-11’s, truck stops and other fine dining establishments that are frequented by many discerning Americans. When these processed foods are heated, the protein breaks down and combines with nitrites to form compounds known as nitrosamines. There are many different types of nitrosamines, most of which are known carcinogens. Nitrosamines promote the growth of various cancers, including colorectal cancer and pancreatic cancer. Solution: The real issue here is the type of meat. Do not eat commercially processed meats. They are not fit for human consumption. Also, what few people realize are some other problems associated with commercially produced processed meats. The FDA has approved a potent mixture of six bacteria-killing viruses designed to be sprayed on these ready-to-eat meat and poultry products. Although many people falsely believe this is a good idea – to prevent disease - they fail to realize the truth: processed meat manufacturers should NOT BE PRODUCING bacteria-laden meat that needs to be purified with viruses. How about addressing the problem at its source? Solution: Cook foods as little as possible. This does not mean you should go out and become a raw food vegan. Eat grass fed meat and eat it as rare as possible. Support local, small family farms that are healthy, clean & safe and produce high quality food that is superior to commercially produced food. The main issue in this report is the FAILURE to distinguish between grass fed meat and grain fed, factory farmed, drugged up animals, living in unnatural conditions that make them sick so they have to be drugged up which makes them sicker and since they are eating grains, they get fat and develop an unhealthy fatty acid ratio (among many other serious problems) which make them unfit for human consumption and oh yeah, carcinogenic when eaten. Cattle are designed to eat grass, not grains. When you feed grains to cattle, they get fat and sick. When humans eat sick animals, they get fat and sick. Pretty simple formula. When cows eat grass and freely graze, they are healthy. This is called ‘nature’. It’s a perfect system and worked without a hitch until the turn of the century. Once we started using chemicals for farming and feeding grains to cows and confined them into dirty feed lots with little (or no) exposure to grass and sunshine and started drugging them up, we ran into some very serious health problems. Grass fed meat has less total fat, less saturated fat, less cholesterol and fewer calories. It has 400% more vitamins A and E, vitamin C, omega-3 fatty acids and conjugated linoleic acid (CLA). Grass fed beef is the richest known source of CLA. With 300 - 400% more CLA than grain fed animals, CLA is a potent cancer fighter that also reduces body fat, increases metabolic rate, enhances muscle growth, lowers cholesterol and triglycerides, lowers insulin resistance, reduces food-induced allergic reactions as well as enhances the immune system. You don’t need to be a rocket scientist to figure out the difference between these two types of cattle farming. One produces meat that is healthy and the other produces food that is deadly. One preserves the environment while the other destroys it. Grain fed beef has higher levels of omega-6 fat, which may promote heart disease, and less omega-3 fat, which is beneficial for heart health. Grass fed beef has higher levels of omega-3 fatty acids which are essential for normal growth, brain function, reduced body fat and have been proven to lower the risk of cardiovascular disease, hypertension, cancer, depression, arthritis, allergies, auto-immune disorders, obesity and diabetes. Research has revealed that too much omega-6 in the diet creates imbalances result in inflammation, high blood pressure, irritation of the digestive tract, depressed immunity, sterility, cell proliferation, blood clots, cancer and weight gain. If you’re eating a diet high in omega-6 fats, you could be vulnerable to prostate, colorectal and breast cancers. For millions of years up until the end of World War II, omega-3 and omega-6 ratios in our diet were in favor of omega-3s (1:1 - 1:2). Now, that ratio is closer to 25:1. Around the turn of the century, heart attacks were rare. Today, heart disease is the number one killer. Simply look at all the grain fed animals we are eating along with the consumption of vegetable oils (high in omega 6) and the solution is simple. Do not eat commercially produced meat and avoid vegetable oils. Is Your Brain on Drugs? Grain fed cattle are injected with growth hormones, antibiotics, vaccines and other drugs. Grass fed cattle got the straight edge - they are drug free. Grass fed farming does not use fertilizers, pesticides and herbicides and other dangerous chemicals. The Environmental Protection Agency (EPA) considers 60% of herbicides, 90% of fungicides and 30% of insecticides to be carcinogenic. Pesticides are neurotoxic, disrupt the endocrine system, carcinogenic and immune suppressive. Pesticide exposure may also affect male reproductive function and has been linked to miscarriages in women. E. coli, mad cow or foot and mouth is much less of a concern with naturally raised grass fed cows. These are issues stemming from dirty, overcrowded confined feedlots. Solution: Start your own farm or choose grass fed & organic food. Apparently, millions of Americans do. You would have to be nuts to eat this type of diet on a daily basis. Nobody should eat the same thing everyday, especially not crappy processed meat. Solution: Rotate your protein sources every four days. Choose grass fed and organic meats and don’t be a wiener - never eat commercially processed meat. Also, not everyone should be eating red meat as often as other people should. We are all unique and have different requirements for food. Some people (we call ‘Protein Types’) require more red meats and can’t tolerate carbs so well. Others (called ‘Carb Types’) require leaner (white) meats and can tolerate carbs much better. Then there are people like me, who fall in the middle and have a ‘Mixed Type’ of metabolism. Solution: Eat according to your metabolic type. The Data Was Collected How? The study looked at people aged 50 to 71 and relied on self reporting. Memory recall for Americans aged 50 – 71? Are you kidding me? Now I know some people may be offended by this comment, but seriously, can we really trust Americans in that age bracket about what they are eating? From my professional experience, you can not trust food memory of people in ANY age bracket. Most Americans I have met, know nothing about nutrition, health and food is simply not priority for them…until they get sick or diseased and then they seem to make it a priority. underestimate how much they eat and since almost every unhealthy person has a emotional issue tied to food, there is certain to be some unreliable reporting and false reporting. I know this for a FACT and do not need any scientific research to prove this to me or anyone else. And how many Americans that age have sharp memories especially about something that is not a priority for them? Solution: Eat grass fed meats as the saturated fat and omega 3 fatty acids supprt optimal brain function & focus. Commercial, industrialized animal farming and meat processors produce sick animals and inferior, disgusting products that make people sick and cause cancer. Grass fed meat – when kept raw or as rare as possible, is very healthy. It has sustained human culture for close to 3 million years. Nature is perfect. It is ignorance of this fact that causes problems on both an individual health and global scale. As soon as people wake up to the fact that nature cannot be beat, no matter how hard you try, and as soon as we start showing respect for this planet, its people and its resources, instead of trying to exploit every possible thing that modern man can get his greedy hands on without any thought of the consequences…the sooner more people will be happier, healthier and relatively free from cancer and heart disease like our ancestors were. The study has many flaws and just so you know – THIS HAPPENS ALL THE TIME. Almost daily. Start your detox and learn the truth about real food. You will be healthier and happier and can avoid the diet & lifestyle diseases that are plaguing Americans (and other cultures who play follow the leader). Article Author: Antonio Valladares is a certified holistic nutritionist, correctve exercise kinesiologist and has been a certified personal trainer and licensed massage therapist for 15 years. He has been featured in The New York Times, Sports Illustrated, Mountain Bike, Paper, Time Out, Woman's Day, NY1 and many others. Antonio is certified by every important organization in the fitness industry including ACE, ACSM, NASM, IYCA, CHEK and others. 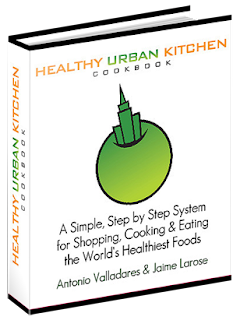 His latest book Healthy Urban Kitchen Cookbook is an organic, gluten free whole foods cookbook which provides healthy eating solutions for busy professionals. His upcoming projects include Fat Loss Psychology and his internet TV show The Urban Nutrition Network. More important than all of this are the results he gets with his clients. Coconut Oil- Liquid or Solid?